The Client is a pioneer in developing innovative IoT convergent products and technologies. Headquartered in the US, it is building the momentum for a new greener smart energy management through home automation solutions. With the high-end, cost-effective backend IoT platform, the client can now on-board hundreds to millions of Smart home devices. The platform, developed using Azure IoT, helps handle & analyze billions of data records for efficient energy management at Smart Homes. Let’s discuss your IoT initiative. Our Client offers Energy Management products like Smart Surge Protector and Smart Wall Plug to home builders, distributors, and end-consumers. These products support MQTT protocol for communication. They developed a VM-based backend platform along with mobile apps to handle and control the connected devices. This platform was built during the Beta development of hardware and it can manage or collect data from up to 5 smart devices. To on-board more such IoT devices using the existing platform was an impossible task. Data security, solution availability, and reliability were other critical factors to deal with the backend solution. Also, different types of smart devices meant various IoT platforms. This means high costs were involved in maintaining such different platforms to handle different IoT enabled products. The client wanted a unique, common high-end IoT platform that would be compatible to on-board any kind of smart devices that they offer. They needed this solution to showcase at CES 2018, and wanted to get into the market quickly. They were fervently looking for a technology development partner, who would help them in building this scalable, cost-effective IoT platform. Due to Saviant’s reliable experience working with various OEMs and for being one of the Top Microsoft IoT partners, the company has chosen Saviant as their strategic IoT partner for their Smart Home Automation solutions. Our expertise in developing IoT solutions for OEMs has helped build a high-end Internet of Things backend solution for our world-class American technology leader client. As per the business requirements of the client, the challenges were divided into two: how to establish a two-way communication between Cloud and IoT based Smart Home devices; and how to devise a centralized cloud data storage for real-time data ingestion to enable analytics & data visualization. To smartly address all these impediments and overcome all the device & data challenges, our IoT consultants have devised the robust cloud enabled backend architecture using Azure IoT platform. Bi-directional communication set-up between Smart Home devices and Cloud has been established using Azure IoT Hub and Web Apps. Quick go-to-market due to Azure IoT based backend platform, which enabled the client to showcase their innovative Smart Energy Management system at CES 2018. Cost-effective IoT solution eliminating hosting and administration charges and the client now offers it free with their Energy Management products. Common backend IoT platform that supports any kind of smart Home device that client offers. Just connect the smart device to the platform for smart energy management and take better decisions to conserve energy. 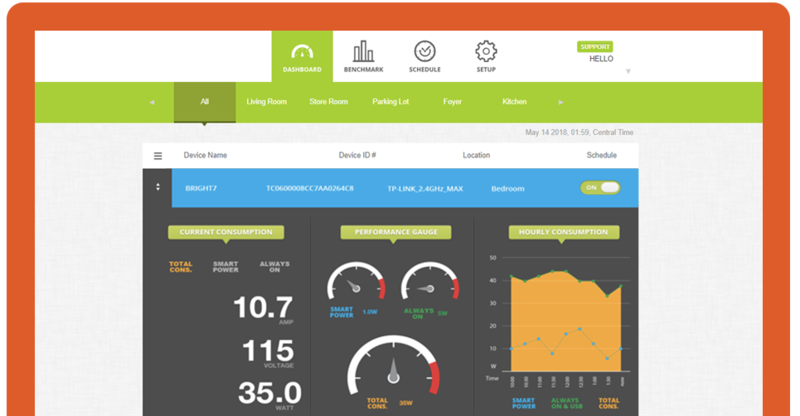 With this high-end, cost-effective backend IoT platform, the client can now on-board millions of Smart home devices and handle & analyze billions of data records for efficient energy management and intelligent decision-making to conserve Energy.